Sometime I have to use the text files created in Ubuntu, using editors, in Windows editors. So basically when ever I create a text file in Ubuntu I append the extension .txt, and it does make the file open in Windows very easily. But the actual problem is the text files created in Ubuntu are so difficult to understand (read) when opened in Windows' Notepad. No matter how many lines have been used, all the lines appear in the same one line. Is there a easy way to save the text files in Ubuntu's basic editors so that it can be seen exactly the same in Windows' notepad? 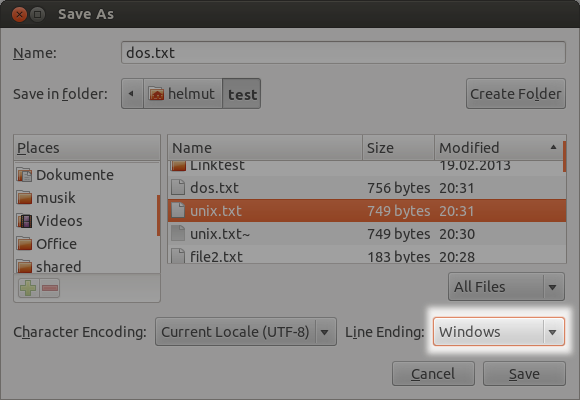 We can let Gedit save text documents with Windows-style line endings in the File -> Save as dialog. Adjust the settings for Line Endings in the drop down menu to Windows. Changing them back is often unnecessary. You will find, that the standard text editors handle Windows-style line termination just fine. TXT file - wrong view on Windows? Notepad doesn't open files created by Gedit? Is there a simple text editor (like gedit) with options to make text bold?